Why you need vehicle graphics. There are many advantages of having a vehicle graphic promoting your business. At SignFX we have over 22 years’ of experience in this industry meaning you can rely on us for your vehicle graphics. We provide our expertise in the Kildare, Dublin and surrounding areas. This isn’t the only service we provide to promote your business, we also offer a printed stickers, shop front signage, window graphics, engraved wall plaques and corriboard signs. 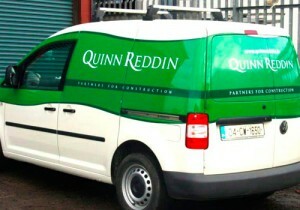 If you like the idea of a vehicle graphic or any of our other signage services then contact us on 045 880 603 or email us at info@signfx.ie. See the tattoo shop shopfront above. 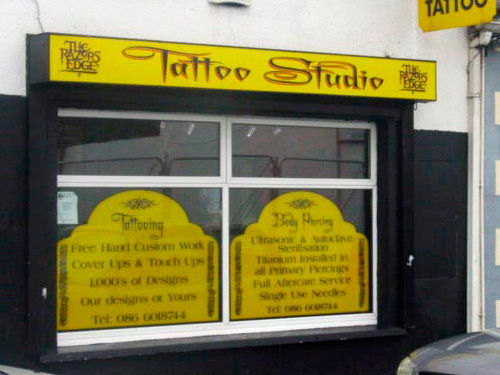 There are two reasons behind the use of its window graphics. One is to inform customers of its products and services. Another is how it fits in with the shop sign above. In a nutshell, this example is used to drive people to the tattoo shop. They see the telephone number at the bottom, and they also associate the livery with the company’s signage.